InvestorCentric: Do Falling Mortgage Applications Signal Trouble For Housing? Do Falling Mortgage Applications Signal Trouble For Housing? Mortgage purchase applications have decreased by 35 percent since the expiration of the tax credit and some analysts are worried that this is a bad sign for the housing recovery. Moses Kim writes that another government stimulus could be in the works to continue supporting the troubled market. See the following post from Expected Returns. The Mortgage Bankers Association (MBA) today released its Weekly Mortgage Applications Survey for the week ending June 4, 2010. The Market Composite Index, a measure of mortgage loan application volume, decreased 12.2 percent on a seasonally adjusted basis from one week earlier. This week's results include an adjustment to account for the Memorial Day holiday. On an unadjusted basis, the Index decreased 21.1 percent compared with the previous week. The Refinance Index decreased 14.3 percent from the previous week and the seasonally adjusted Purchase Index decreased 5.7 percent from one week earlier. The unadjusted Purchase Index decreased 16.3 percent compared with the previous week and was 30.4 percent lower than Memorial Day week last year. 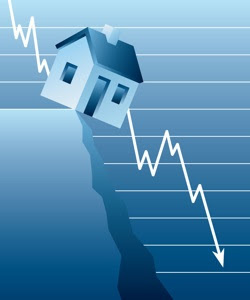 The double dip in housing appears to be intact as near record low mortgage rates have failed to spur new demand. Refinancings remain low relative to mortgage rates, and it's pretty safe to assume that most people who qualify have refinanced at this point. I think it's about time we call a spade a spade and deem the government's programs a failure. Homebuyers who rushed to buy homes and lock in low rates will soon realize they may have jumped the gun since we should see national declines in home prices in the second half of the year as sales screech to a halt. As home prices resume their fall, I predict the government will try to think up another useless program to prolong the agony in housing. However, the only cures for housing are lower prices and job growth. Since the government seems hell-bent on preventing either from happening, we should be in for some long-term pain in housing.